هجوم جيش تشيلى على قصر الحكومه وقمع المحتجين. انقلاب تشيلى 1973 (اسبانى:Golpe de Estado en Chile de 1973), دى حدث الانقلاب يوم 11 سپتمبر 1973, بالعاصمه التشيلى سانتياجو, واللى اعترض الجيش التشيلى على فوز الشيوعى سلفادور الينيدى رئاسه الحكومه, ودخل الجيش بعمل وحشى واللى ادى الى موت الينيدى, يقود الانقلاب والحكم والسلطه هوا اوجستو بينوشيه. ↑ Lawson, George (2005). Negotiated Revolutions. p. 182. The only armed resistance came in a handful of factories, the La Legua poblacion in Santiago and in isolated gunfights with MIR activists. ↑ اسم طويل باللغه الاسبانى, واللى اتكتب كده"Golpe de Estado del 11 de septiembre de 1973". ↑ Peter Kornbluh. "Chile and the United States: Declassified Documents Relating to the Military Coup, September 11, 1973". 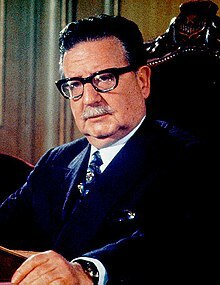 ↑ "CHILE: The Bloody End of a Marxist Dream", Time Magazine, Quote: "....Allende's downfall had implications that reached far beyond the borders of Chile. His had been the first democratically elected Marxist government in Latin America..."
↑ Genaro Arriagada Herrera (1988). 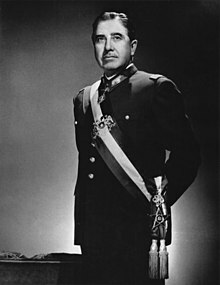 Pinochet: The Politics of Power. Allen & Unwin. p. 36. ISBN 978-0-04-497061-3. ↑ Winn, Peter (2010). "A Century of Revolution". In Grandin & Joseph, Greg & Gilbert. Duke University Press. pp. 239–275.